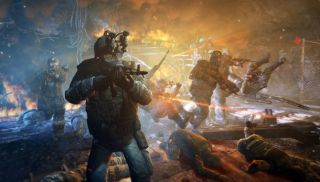 4A have posted the last of their Metro: Last Light survival guides, this time focusing on the tools you'll need to thrive in the post-apocalyptic hellscape they've created. There are gas masks, letting you breathe the suffocating toxic air of the surface; weapons, with which to defend against mutants and bandits; and a lighter, used to... er, burn down cobwebs. Bothering spiders doesn't sound like the most pressing survival tactic, but I guess everyone needs a hobby. For players of Metro 2033, much of what's seen here will be familiar. Pumping the dynamo of a flickering torch, checking your watch to ascertain your visibility, and balancing military rounds between high-damage fire and trade. It suggests the sequel will deliver a similarly claustrophobic experience - although that's hardly a problem given the quality of the first game. Metro: Last Light is due out May 17th. Preview here .